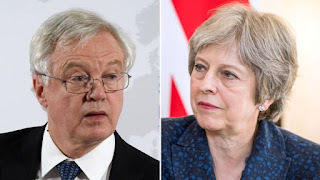 The UK's proposed "backstop" plan for trade with the EU after Brexit has been published after an "expected" end date - of 2021 - was included in it. It followed crunch meetings between Prime Minister Theresa May and Brexit Secretary David Davis, who insisted a cut-off date be included. The proposal would see the UK match EU trade tariffs temporarily in order to avoid a hard Irish border post-Brexit. Brexiteers want to ensure the backstop could not continue indefinitely. Responding on Twitter, EU chief negotiator Michel Barnier set out the criteria on which he would judge the UK's proposal, including the need for a "workable solution" to avoid a hard border in Northern Ireland.